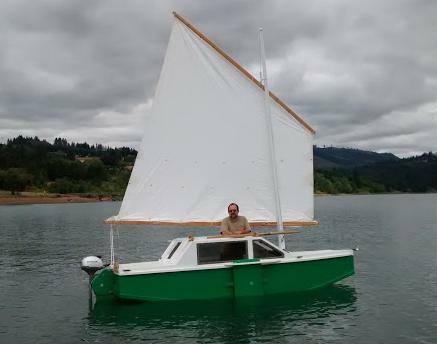 (15 April 2019) We continue a series on polytarp sails. The May issue will finish the topic. Another Blobster is going together Down Under, this one by Steve Kosch. 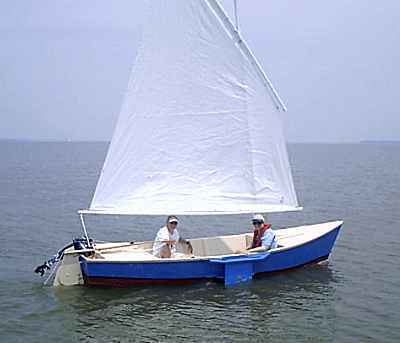 You recall the pattern we developed for a small lugsail to be made from a single sheet of polytarp. The pattern was predetermined to give a certain draft. The pattern below is for a Piccup Pram sail, about 70 square feet of area and 10% draft. We're going to cut and sew this sail. As we discussed last episode, we have this pattern drawn in felt tip pen on polytarp such that no edge comes within about 2" of the edge of the tarp. We will not use any of the preformed edging on the tarp. Don't be tempted to do so. As for tarp material, I prefer the "Coleman" brand sold at Wal-mart stores although I doubt if the other ordinary tarps are much different. I haven't tried any of the "heavy duty" tarps although they might be worth a try. A few issues ago I suggested looking at the polysail page for gourmet tarps. Since I wrote that I saw some examples of those tarps at the messabout at Bloomington, Indiana in September. They are indeed superior to the common tarps, not only slightly heavier, but they can be bought in pure white, something I've never seen in a polytarp. The tarp will be hemmed along the foot, head, and leech. So those lengths should be cut about 2" outside the line. The luff can be cut right to the line. DON'T CUT THE LONG V'S FROM A-C-A2 AND FROM D-E-D2! Instead cut straight across from A to A2 and from D to D2. The darts at the two major shaping seams will be sewn as shown in Figure 3. In Figure 2 the two shaping seams appear as the deep V's of A-C-A2 and D-E-D2. Break out the sewing machine. Any sewing machine will sew polytarp although you should use one that will sew a zigzag stitch. Use a rot proof thread like the V69 polyester SailRite sells. Practice a bit if you aren't used to sewing. Read the manual if you've got one. I'd suggest you try the widest seam first, the wide ones seem the easiest. Practice sewing one or two with some scrap. First fold the cloth on the centerline of the seam. You might secure the fold temporarily with clothespins or paperclips. Then sew, using a straight stitch, from the inner part of the seam to the outer edge along the smoothly curved line shown in the figure. If you were to sew a straight line from point C to A you would end up with the double wedge shape of the original pattern (or something like it - the flexible cloth probably wouldn't take the exact shape.) But if you sew the ever-broadening curved line shown you will get a sail with smooth curves and the original double wedge will be converted to a smooth airfoil with the desired draft. Next open the fold and pull the cloth tight across the seam. It won't be flat anymore but that's the whole point of the special seams. There will be a little flap of material sticking out. Fold it flat and sew down the loose edge with a zigzag stitch. Then sew over the other edge of the flap, that is the edge with the straight stitch, with the zigzag stitch to further secure it. Repeat with the other seam. Let's take stock of what we've done. 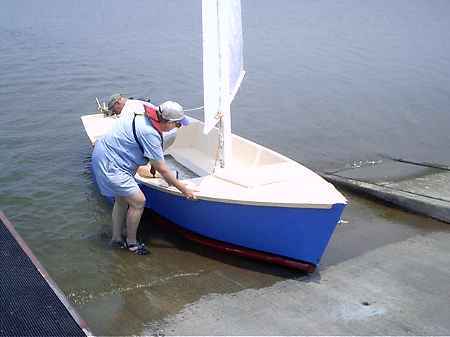 The sail has already been cut to its final dimensions and seamed to its final shape. All that remains to complete the sail is to sew in the corner reinforcements, sew the perimeter hems and reinforcements, and set the grommets. It took me an hour to get to this point on the Piccup sail. It took me two more hours to complete the finish details. The corners and reefing areas need to be reinforced with four layers of polytarp. 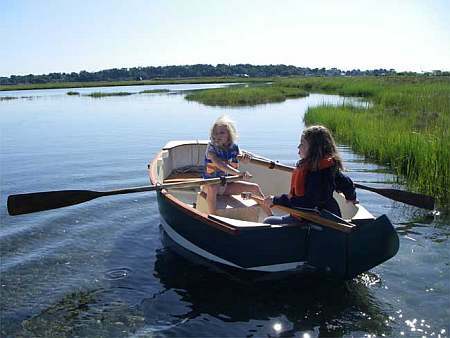 Two layers of regular Dacron sailcloth would also do the job.) That provides strength against tear out of the grommets and stiffens the material to prevent folding under stress. I usually make the reinforcements about 8" long on a side. There are lots of ways to shape these patches. Sew the patches down well with a zigzag stitch. 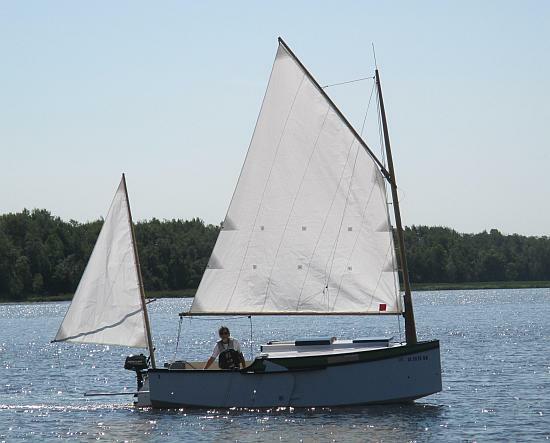 On a smaller sail like this 70 square footer I usually make all the hems, except the luff hem, with a simple folded over hem about 2" wide. I've had no trouble. Some might prefer to reinforce all the edges, especially the head edge, with something like 4 ounce sailmaker's tape, 3" wide, folded in half and sewn over the edge. Sew it all down with a zigzag stitch. Reed Smith, who sometimes sails his Piccup in the open ocean (Gulp!) said he had a problem with the leech stretching so perhaps that edge might get a treatment similar to that of the luff. The luff hem needs a stiffer and stronger treatment. 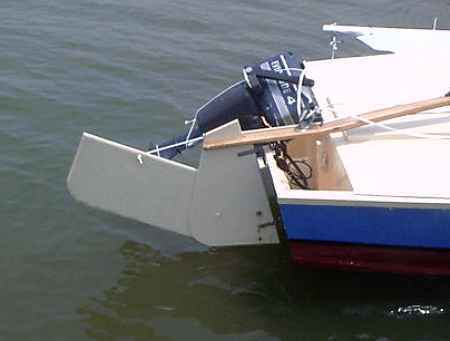 I've been using 3" wide fiberglass tape, the same stuff used to make taped seam plywood hulls. It's fairly inexpensive and very easy to sew. It's edges are treated to prevent unraveling. Dacron sailmaker's tape would also be ideal. Here is how I do the job with fiberglass. I just sew a 3" wide tape down each side of the luff. The ends, which will unravel badly if left raw, are doubled under the last 6" or so before being sewn down. That prevents unraveling and also provides a second layer of material in the region of the end grommets, the most highly loaded grommets in the system. It might be advised to sew a final protective layer of tarp over the top of the glass tapes as the tapes seem to abrade easily with handling. All the luff sewing is with zigzag. At this point all the sewing is done. 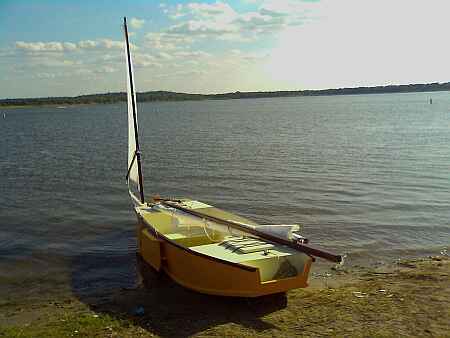 A smaller sail like this one can use ordinary brass #3 grommets all around. A good hardware store might have them plus the simple tools needed to install them. A bit of warning - I've heard that some of the grommets are brass plated steel. That type looks exactly like real brass when new in the box but they will rust shortly. Try to get real brass. Practice setting a few grommets in scrap. They need to clamp tightly on the cloth but not so tight as to cut the cloth. Place grommets at each corner with about 1" edge distance. Then along the hems in the head and foot spaced about every 15". The sail is done! It took me three hours of work to get to this point. No doubt it could be done quicker. If you're not used to sewing you should expect to take longer.